Fiordland National Park is located in Southland, on the south west coast of the South Island. It is the largest of the national parks at 12,500m^2. It’s name derives from a number of deep fiords that were carved out by glaciers in past ice ages. Located in Fiordland National Park, the Milford Sound Track has much to offer. From New Zealand’s largest water fall to snow dusted alpine cairns, there is a reason it is the countries most popular track. My father and sister came down for a 22 day visit and this was the final stop on the itinerary (I wanted to make sure they would sleep well on the plane). In the end we agreed this was the most physically demanding thing any of us had done. We where happy to have gone through it together. Overview of the trip. Day 1 is shown in red (5 km). Day 2 is shown in yellow (16.5 km). Day 3 is shown in turquoise (14 km). Day 4 is shown in purple (18 km). The first day consisted of a short boat ride and a short walk. As the boat approached the beginning of the track on Lake Te Anau we were able to get some great views of the rocky hills shrouded in mist. We were happy to see anything as Fiordland is notorious for it’s rainfall – more than 200 days a year with 6,800 mm annually on average. Once we reached the track it was a short walk through beech forest to the Clinton Hut. On the way we stopped to check out a bog board walk that had some cool plants. The weather was great – almost no rain. The view from the boat on Lake Te Anau as we approached the trail head. Fiordland is overcast 2 out of every 3 days on average. This climate is driven by predominantly south westerly winds blowing up from Antarctica. The ocean air is moist, and as it rises over the mountains it loses density subsequently dropping it’s moisture on the land below. The second day is decent length with a slight incline, all the while following the Clinton River up its course. The track begins in beech forest, and shifts towards more scrub as you gain elevation. As you head deeper into the valley the rock faces rise high around you, providing some much needed existential perspective and many waterfalls. Mintaro Hut is located at the head of the river, and has a porch overlooking the surrounding mountains peaks. Again we got lucky with only light showers. Ferns (pteridophytes) are an ancient group of plants thought to have originated during the Devonian Period of the Paleozoic Era 360 million years ago. Their vascular tissue set them apart from the plants that came before them, and reproduction through spores and frond leaf architecture set them apart from plants that came after. The third day was the most arduous. 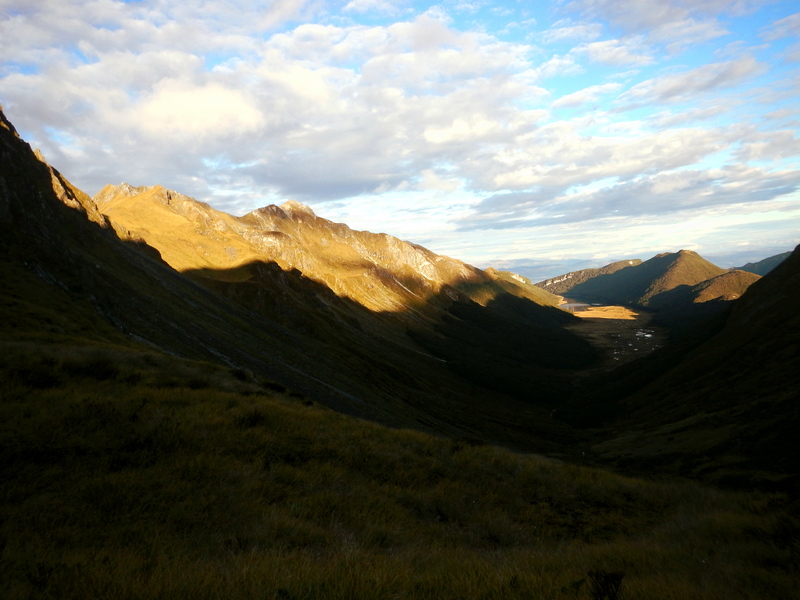 Although short in distance, this is the day you must hike up and over McKinnon Pass. The track starts with a great deal of switch backs, with the vegetation shifting to subalpine with numerous buttercups and daisies. It started snowing as we approached the top, and the snow covered flowers and grass fields provided some unexpectedly beautiful white scenes as we were buffeted by wind. At the top we stopped for a much needed break and some hot coffee. The decent was not any easier – it was steeper as well as wet and slippery. There is a side track that takes you to see Sutherland Falls, the highest waterfall in New Zealand. Once we made it down the rest of the walk is nice and flat until you reach Dumpling Hut. 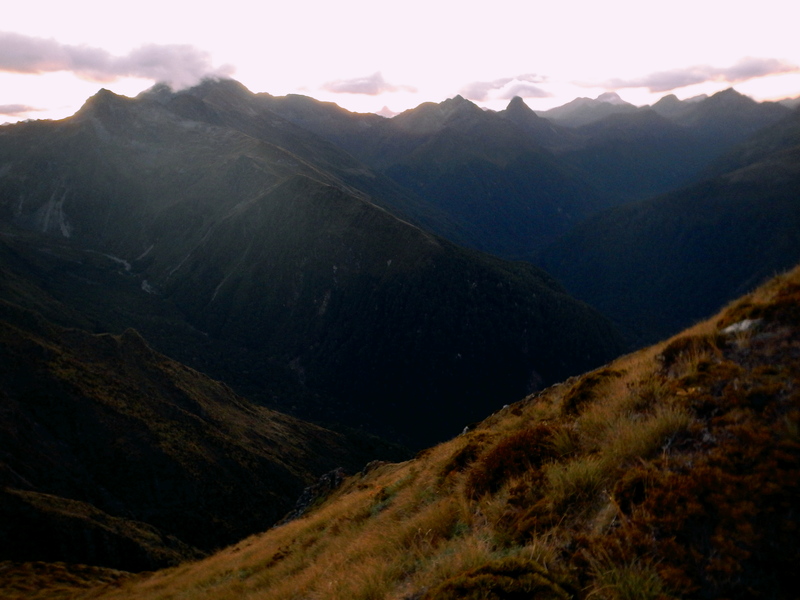 With some snow and wind on top of the pass and some showers as we descended we had a decent day for tramping. A snow dusted cairn near the McKinnon Pass. 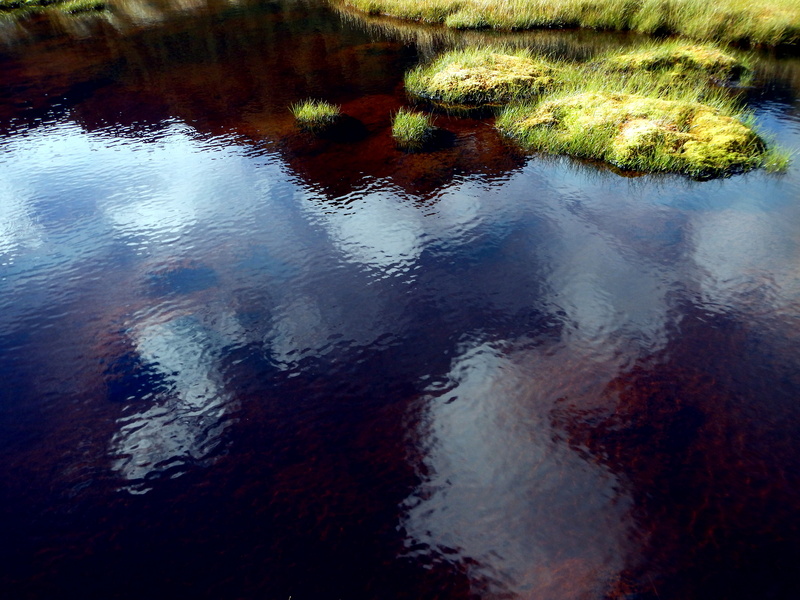 These ponds occupy amphitheater shaped depressions once occupied by glaciers. The large ice mass sculpted and depressed the hard granite, which now holds the water like a large rock bowl. The final day is a nice flat hike out to the boat pick up location. The track follows the Arthur River down the valley through more beech forest. The trail cuts through some cool rock passages, has a few bridges, and some real cool boardwalks. Only on the final day did we feel the true power of Fiordland precipitation. With heavy rain starting early in the morning, we were soaked through before tea time. However, the water added greatly to the experience. The valley walls were littered with waterfalls – literally too many to count. I had a hard time seeing them through my glasses, but it was worth it. We were happy to get inside and warm up/dry off after the trip. Once in Te Anau we went straight to a cafe, had a big feed, and chugged some beer. After that, spontaneous road trip back to Dunners! Their flight home was the next day. Overall, the trip was a major success – the family bonded over the four days and we all came out super fit. It was also the first time I organized a trip by myself which was a good challenge. We are hoping to do another family expedition in the not too distant future! Midwest family getting damp in the NZ bush. Milford Sound Track is New Zealand’s most popular great walk for a good reason. The scenery, vegetation, and experience are worth the effort and money. It is of moderate difficulty so anyone who has been on a few other tracks should have no problems with this one. Categories: camping | Tags: adventure, blog post, botany, camping, ecology, Gregory Thomas Nelson, Nature, new zealand, Photography, Science, tramping, travel | Permalink. I went on my fourth New Zealand tramp January 13th-15th in Mount Aspiring National Park. The track is called the Gillespie Pass Circuit which included some beautiful, but challenging, terrain. Mount Aspiring National Park is in the South central part of the South Island of New Zealand, in the West Coast Region. The park was the 10th created, established in 1964. It also contains the Matukitui Valley, Routburn, and Rees-Dart tracks. The track begins North of Makarora, heads south along the Makarora River, follows the Young River up into the Young Valley, ascends the ridge and passes through Gillepie pass, descends into the Siberia Valley following the Siberia River, and then heads into the Wilkens Valley. From there you can either hike back into town or catch a boat ride back. The route of the Gillespie Pass Circuit. Day 1 is in red. Day 2 is in purple. Day 3 is in blue. Due to weather contraints we were unable to visit Lake Crucible, and took a jet boat back to town a day early. Day 1 (red): We started at the Blue Pools scenic area, just North of Makarora , where the track is adjacent to sheep/cow farms and has mostly open grasslands with lots of invasive species. Once you get close to the Young Valley entrance the vegetation shifts to silver beech [Nothofagus menziesii] forest. Elevation is slowly gained as you travel to Young Hut. Sun was out all day. The legendary Blue Pools. The blue color is created by “glacial flour” in the water. These minute rock particles are created by the grinding action of glaciers against rock, and reflect light while they are suspended in the water. Day 2 (purple): The day begins heading further up the Young Valley. Elevation is more quickly gained here and the vegetation quickly shifts to subalpine with Hebes, small tussocks, daisies, and buttercups abounding. The track takes a steep incline as it heads up the East face of Mount Awful and up to Gillespie Pass. The top is truly alpine with mat plants and lichen throughout. From the Pass there is a great view of the surrounding mountainscape. The descent has a much lower grade and passes through another subalpine zone with more Chinochloa, Dracophyllum, and Aciphylla. 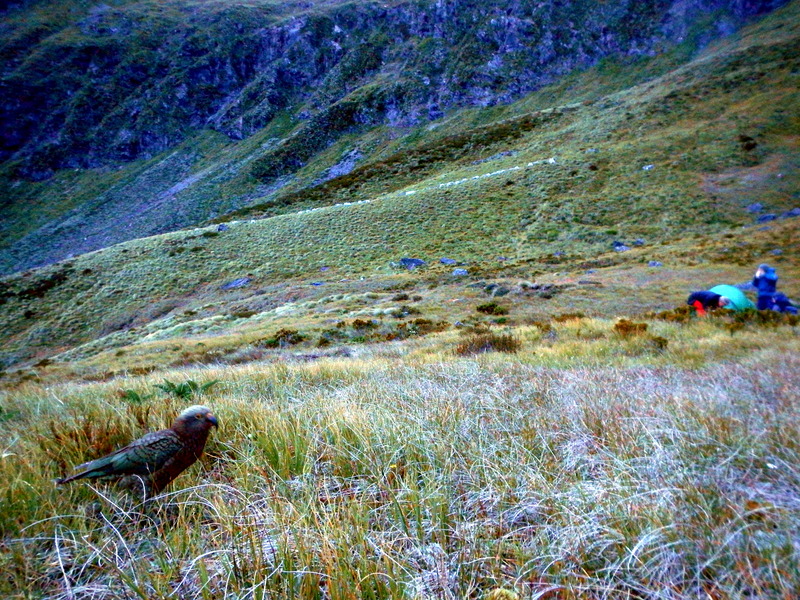 The final leg of the long day is walking though an open grass meadow along Siberia River to Siberia Hut. Mostly sunny with some clouds during the early afternoon. The view from the pass wasn’t too bad. Day 3 (blue): An easy day from Siberia Hut to the jet boat pick up area begins with more open meadow. Soon though, you are back in the silver beech forest until you reach the Siberia-Makoroa River confluence. We got picked up by a jet boat from there back into town. RAIN. A wild weevile [Curculionidae] was spotted. The beetles mouth is located at the end of the snout, which it uses to bore into the seeds, wood, stems, roots, or leaves of plants that it eats. All in all, the track has awesome mountain views, cool vegetation, and a good cardio workout to offer and I highly recommend it. However, the track can be treacherous especially under poor weather conditions and thus earns the “Experienced Trampers Only” categorization from the Department of Conservation for a reason. Choose a few days with nice weather for this one. German on the ridge line. Norwegian in the natural habitat. Categories: camping | Tags: adventure, blog post, botany, camping, ecology, Gillespie Pass, Gregory Thomas Nelson, Makarora, Nature, nature photography, new zealand, Photography, tramping, West Coast | Permalink. My most recent field expedition was to Takahe Valley; a place with an interesting conservation narrative, beautiful scenery, and a fantastic place to do research. 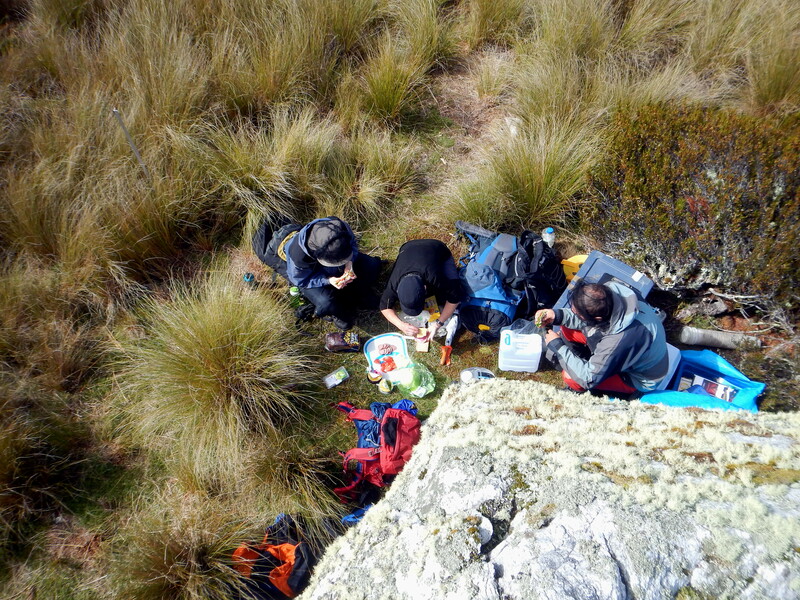 I went to Takahe Valley March 7th – March 10th with along with two Landcare colleagues and another PhD student. Our purpose was to assist with end of the summer field data collection. 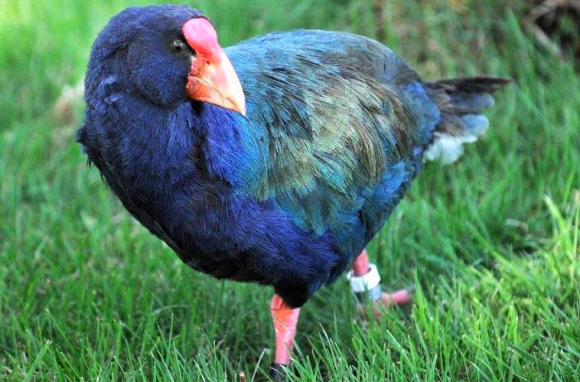 Those of you well versed in your New Zealand native birds will recognize the name takahe (Porphyrio hochstetteri). The species was thought extinct when the last 4 known individuals were captured and killed in 1898. However, Geoffrey Orbell rediscovered a remnant population of the birds in a place isolated from human activities near Lake Te Anu (Takahe Valley) in 1948. Concerted conservation efforts since rediscovery have resulted in relatively successful recovery. The Fiordland National Park was created to ensure them a safe home, and deer control is carried out within the park to reduce competition for food. The wild population estimate as of 2013 is 263. I wasn’t able to see any of these beautiful birds (locally “blue chickens”), but I was able to see signs of their presence including well traveled tracks, digestive remains, freshly munched tussock grass, and tracks. Hopefully next time I will be able to sneak a peak! I was able to see some other charismatic birds though including a Kea (Nestor notabilis), NZ rock wren (Xenicus gilviventris), rifleman (Acanthisitta chloris), and tomtit (Petroica macrocephala). A Kea investigating our campsite, as well as me, to see if it can get an free feed. The Fiordland foothills are composed of gneiss (metamorphosed from mostly granite and diorite). Apparently this is some of the oldest rock in NZ, originating from the Ordovocian period. The valleys and basins were etched through glacial erosion during the last ice age. Alpine areas have exposed rock or scree substrate, while basins soil is composed of podzolised gley and organic soils. The vegetation in our valley ranged from sub-alpine herbs up on the exposed rock and scree at the valley ridges to wetland species down in the basin. Beech forests and tussock grasses can be seen covering and deferentially partitioning large swaths of the valley. The basin has a river flowing through it. This area is dominated by wetland vegetation. Tussock grass vegetation dominates portions of the basin, as well as some portions of the lower and upper walls, of the valley. Forest dominates most of the midsection. We camped partially up the valley, at the head wall. This area has some tussocks but also some sub-alpine herbs due to the higher elevation and some wetland plants from the the head water flow. The head wall ridge. This area has exposed rock and screes, mostly dominated by sub-alpine plants with some small tussocks. The main purpose of our trip was research. There are transects of tussock grasses here that have been measured for over a decade, investigation the masting events of the tussocks (Chionochloa sp.). Masting is the phenomena of some plants to usually not produce many flowers/seeds most years, but every few years they will all create massive amounts of flowers/seeds. In North America most oak trees (Quercus sp.) display some level of masting. Another component of the research is to investigate the interacting influences of anticipated climate change, increasing soil N, and increasing soil C on tussock growth as well as reproduction. Climate change is simulated by putting translucent plastic around the bases of the tussock (creating a mini green house gas effect). Soil N is increased by adding fertilizer. Soil C is increased by sprinkling sugar on the plots. We had to count the number of tillers (stems) on every experimental plant (counts ranged from ~30 to ~800). The cages are to protect the tussocks from takahe, as this is their favorite food. 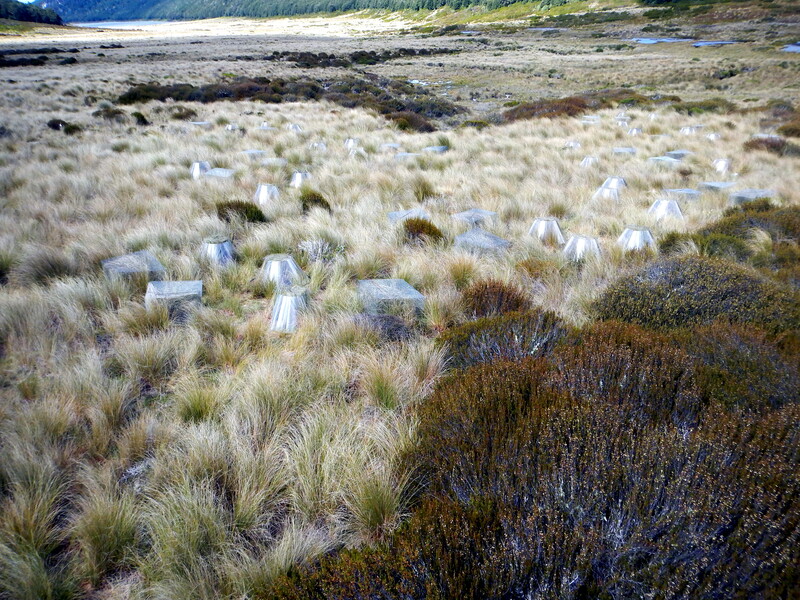 These are the experimental plots on the red tussock (C. rubra). We also collected invertebrate data for each plot to see if the treatments (temperature * N * C) had an influence on invertebrate diversity or community composition. Me emptying invertebrates from pitfall traps. These traps passively capture insects by trapping them in a cup filled with death liquid. It was a fantastic trip filled with good company, good weather and goo food. I eagerly await my next expedition into Takahe Valley! Categories: Science rules! | Tags: adventure, blog post, botany, camping, conservation, ecology, Evolutionary Ecology, flikr, Gregory Thomas Nelson, Nature, nature photography, new zealand, Photography, research, Science, travel | Permalink. Thanks to my wonderful girlfriend, I have recently acquired a nice digital camera. This has inspired my to take my hobby of nature photography more seriously with the hopes of developing my naturalist and artistic lenses. Along these lines, I have also started a flikr account to host my higher quality images . Currently my account has only favorites photos of mine from trips to the Boundary Waters, Superior North Shore, California, Utah, India, and Galápagos but new shots from New Zeland will follow soon. Categories: Uncategorized | Tags: flikr, Gregory Thomas Nelson, Nature, Photography | Permalink. This afternoon I am heading to New Zealand for the first time ever. This post coincides nicely, as it is my first blog post ever. With the hopes of more intimately being able to share my experiences with my friends and family I am starting this page to chronicle my current and future expeditions through candid thought and photography. If you are interested in nature, science, traveling, Magic, or me these posts should be of interest to you. I invite you to follow me as I seek to strike a life I won’t regret. This is merely an introductory post; more about what I’m actually doing, where I am, and what I see will follow shortly. Categories: Uncategorized | Tags: adventure, blog post, Gregory Thomas Nelson, Nature, new zealand, Photography, Science, travel | Permalink.